I saw Chery Phillips from Phillips Fiber Arts demonstrating her Attic Windows Ruler on You tube and I was impressed. I have never made an Attic Windows Quilt block so I don't have an appreciation for joining Y seams. This got me thinking about the triangle dies I have and wondering if the dies I have could be used to make this block as well. Stay tuned and I'll let you know how it goes. Wine & Cheese, yes Age DOES Matter....however....there are lots of other things that age affects as well. Take for instance all the glue I had on my shelves. The oldest co-worker had an assignment and he needed to create a web of sorts out of yarn. WORD TO THE WISE: When you buy any new glue, fabric marking pens, applique adhesives or other sewing notions that may have a shelf life....LABEL IT with the date of purchase. I wish I had done that....could have saved me lots of time and frustration. What did we end up using? Yep....good ole Elmer's Glue. Thankfully we had some! Suffice to say the other bottles are in the recycle bin. Next time.....I'll take my own advise. PS...I didn't try the E6000 because I was afraid it would glue the yarn to the cloth permanently. That stuff is mighty powerful....I know because it was glued onto the bottle next to it on the shelf.... and the reason it is in the photo. My PA quilt top is finished....almost! Yes, I used Mary Jane's beautiful Bernina 820 to finish this top...thank you for all the encouragement and support! This pattern is the absolute best for scrappy quilt making because it really doesn't matter what fabric you use as long as the center blocks are lighter. Christmas mixed with Halloween and add some Easter...who cares....the only thing that shows is the light and dark patterns. I want to add a thin inner border and a little wider border on the outside. Wouldn't you know that not a single piece of fabric that I own looks good for the outside border....is that crazy or what? You know I'm not going out to buy fabric.....I'm going to hit up some local friends and if need be, long distance friends after that. I've already been through Waldo's stash and that is where I got the lighter inner border. It came with 6 shelves total and some were sagging in the middle (don't even think about the my sagging middle) so I have some books on those shelves to straighten them out. Sure wish it were that easy to straighten myself out...LOL The shelf was $15 and I was thrilled because buying the materials for hanging shelves would have been much more. A friendly soccer game with the opposing team wearing shirts. Too funny. Naturally their parents would be cheering them on from the sidelines. That is all from here....hope all is well with you and yours! Are you as crazy about vintage sewing notions as I am? I found this mini ironing board in a shop in PA recently that just tickles me. The sewing machine you see in the back ground belonged to my girlfriend, Mary Jane (you may recall she passed away Aug. 20th). I remember when she got it brand new from Leon at Hoovers Bernina Sew in Mifflinburg, PA. Mary Jane really enjoyed this machine and was always saying great things about Leon at Hoovers....which means there is a lot of positive energy in this beauty! She insisted I learn to use her new machine even though I was very intimidated by the size and the fancy buttons. We were sewing together one day and she said to me, "when I die, you are going to have this machine." Naturally I burst into tears and told her I didn't want that sewing machine, I wanted her so she could just take that thought right out of her mind. Thankfully several years went by before her pride and joy was passed along to me. I only wish it had been 30 more years before her 820 came to live with me. Mary Jane's sewing machine has been sitting where my machine used to be. My mind was telling me..... turning on her sewing machine would mean she is really gone. I know that thought makes no sense....but grief in my experience isn't rational or linear....it's just a process. I can't seem to get used to seeing her things at my house.....this new reality will take time to embrace. Today I turned on Mary Jane's sewing machine and began to sew. The tears streaming down my face made it difficult to see to wind the bobbin....but I managed. What an amazing, beautiful and life changing gift......my lovely girlfriend Mary Jane....not her sewing machine. I miss her every day. Are you a hard sell when it comes to quilting books? I have grown more and more difficult to please in the past few years. The books I'm willing to purchase must provide inspiration and instructions that are thoroughly explained. With limited sewing time and a big stash....finding the right book and/or pattern really increases my motivation and desire to make a quilt. If you are anything like me, Fabric Play by Deanne Moore, certainly fits that criteria. Most of you know, I love a paint factory explosion of color, so the cover of this book didn't hit my sweet spot. I'm glad I didn't let that mislead me....this book has fourteen different designs that can be as individualized as the person who makes or receives a quilt. I love, love, love this pattern and to be honest, I'm certain what grabbed my eye was the Kaffe Fassett fabrics. 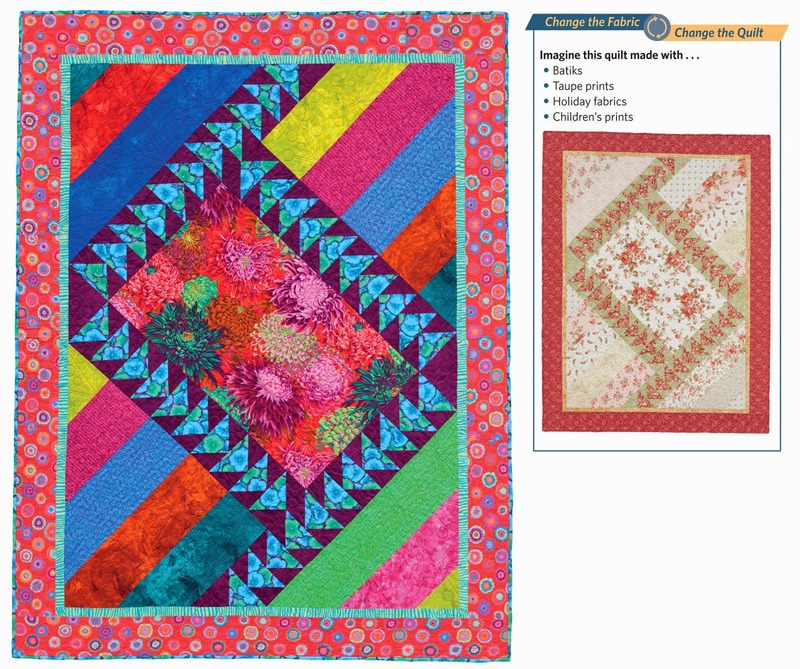 Once I saw the quilt on the right, using different fabrics, my mind was opened yet again to other fabrics I have in my stash that would be beautiful with this pattern as well. The point here, is "Change the Fabric, Change the Quilt"....but are you capable of seeing a pattern made up and then visualizing your fabric choice in its place? My eyes can confuse my brain (yes, that does happen) and Deanne has the solution. 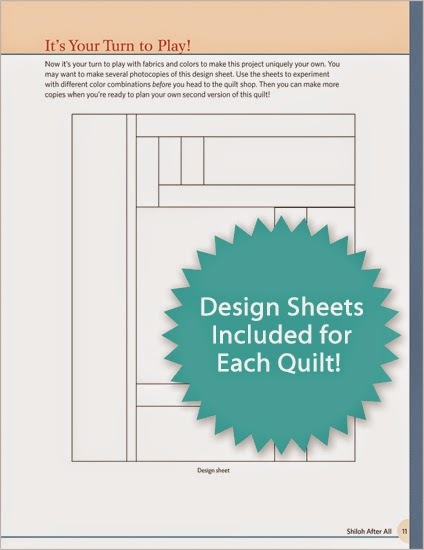 A Design Sheet for each and every quilt in the book. Once I saw the blank Design Sheet, my eyes and brain began working together. I can now venture into my stash and see so many more possibilities. Fabric Play is an excellent choice for stash busting. How many of us have those fabrics with large prints or panels and we don't know what to do with? I can see all your hands raising now (You didn't know I can see you on the other side of the screen? Go comb your hair because I do see you :). "Structure" is a perfect pattern for all those panels and fabrics that you have in your stash that you have wanted to use. I can see this quilt being loved by children, teenagers and adults....depending on the fabrics you use. Fabric Play certainly dishes up a heaping helping of versatility. Being visual, I really like diagrams and photos that describe the instructions. Written instructions alone are almost useless for me. Deanne has provided ample diagrams and photos that illustrate the instructions ....WELL DONE Deanne Moore! 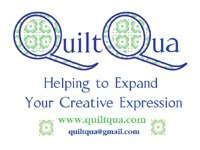 Fabric Play is appropriate for all skill levels....from a beginner to the experienced quilter. I Have A Notion ® will have Fabric Play at the beginning of October. 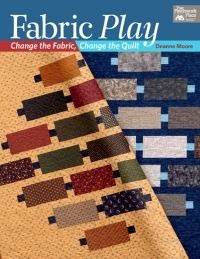 If you must have it now, Fabric Play is available on Deanne's website, Creative Sewlutions @ The Quilt Haus as well as Martingale. With 14 different patterns to choose from, there are definitely enough options to put a huge dent in our stashes. You know what that means right? More fabric shopping trips....which could include lunch and chocolate too....I better stop before I drool on my keyboard. It's true...and you know what? I missed it!!! :( Unfortunately I was at a memorial service for my dear friend who recently passed away. I do my very best not to miss out on the great vendors and classes at the Checker Distributor Open House each year, but it could not be helped. Edyta's latest book, "Handfuls of Scraps Pieced into Amazing Quilts " lines up perfectly with what I've been thinking about lately. My girlfriend who was very ill before she passed did not use her quilts to keep warm during her illness. Most of Mary Jane's quilts are show pieces and not "everyday quilts." I want tons of "everyday quilts" not only for myself but to give to people that I love to keep them warm when they are cold and/or sick. Show pieces are wonderful, don't get me wrong....but an "everyday quilt" now that's my kind of quilt. In Edyta's new book, "Handfuls of Scraps Pieced into Amazing Quilts," includes 15 scrappy patterns that are perfect for "everyday quilts." 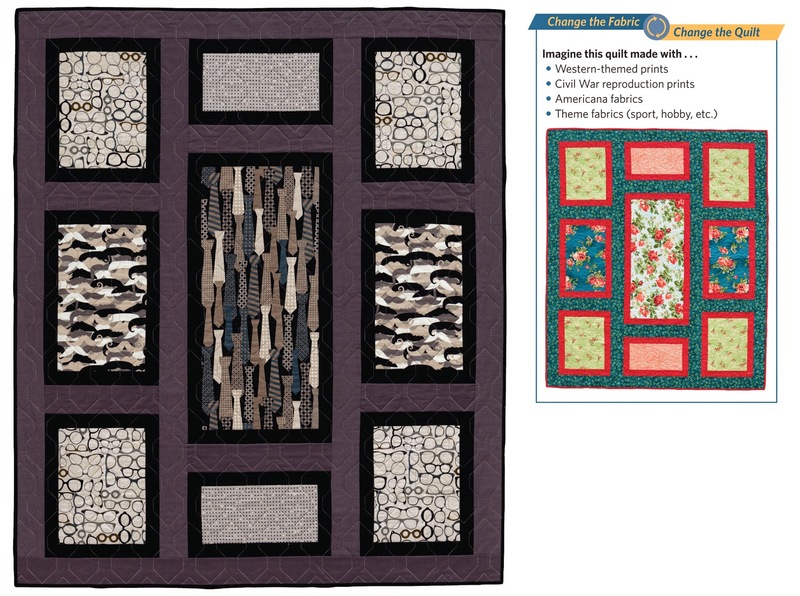 Now these are what I call truly scrappy quilts. The type of quilts I would wrap up in and proudly carry back and forth to the hospital etc. They are beautiful and useful....right up my alley! If you want to add some pizazz to your scrappy quilt you can add borders that include some of Edyta's Silhouettes (pre cut applique shapes). I wished I could have visited with Edyta but it wasn't in the cards this time....hopefully sometime soon because I have always admired her work and she is a lovely gal. Speaking of lovely gals....Waldo needed a binding sewn to one of her quilts and I was tickled to be able to stitch it for her. This was yesterday and I finished the binding....this is such a beautiful quilt. It is 50x70 and it was quilted by Joanne from Splitting Stitches blog. Hand stitching is so relaxing and Waldo thought I could use some relaxation recently....she offered more quilts that need binding and I may just take her up on it. Friends, fabric, quilts....sounds like a shot in the arm to me...makes me happy. When entering the Gmeiner, I was mindful that this was a celebration of many women's accomplishments, many of whom I know. At the same time, I was also very aware that this would be the last time my dear friend, Mary Jane (if you don't know who I'm referring to, you can click here and here) would have entered a quilt in the show and I have a difficult time holding back tears. When I walked past this next display...there was no holding back tears...and I did my very best to smile and honor Mary Jane's memory while enjoying the company of other woman who knew and appreciated her. Not sure I did a very good job...but that was my goal! Walking through the exhibit was a big high for me because I know many of these gals and to see there work being displayed and admired is such a big buzz. Leaving Mary Jane's entry for absolute last, I figured I could keep from needing a childs swimming pool to collect the fluid that might rush forth from my face. Taking a step back I noticed two Pennsylvania Block quilts. The one on the right belongs to Chris Cooper and her description is below. What a gift all of these women share....the time and ability to get together and sew. A block exchange seems like such a loving and giving project, I'm going to consider starting one with some friends as well. Having children and a business has kept me from being able to participate in many of this groups projects...at the same time....I've had the pleasure of seeing their work and knowing them....a treasure! Speaking of treasures.....there was a Waldo sighting at the show!!! Yes indeed....Rosemary aka Waldo traveled along with me and she sure is a treasure. The small quilts behind Waldo are part of the "Colors of Cancer" exhibit. These quilts were made by members of the guild in memory of a person has died from cancer, been a survivor of cancer or because they wanted to make an art quilt to be sold to raise money for the American Cancer Society of Tioga County. I bought the small blue one above Waldo and to the right. What a wonderful project! There are many more quilts that I was not able to photograph. The exhibit was full for the opening and I felt lucky to get the photos I did take. A quick trip back to PA to honor the memory of my girlfriend and see the MLQG Quilt Show that was dedicated to Mary Jane. Reetha Shumway, who has also passed, was honored as well. I remember Mary Jane telling me many times about the two sisters, Reetha and Ruth Ann, who had made piles of charity quilts and how she admired their dedication to providing so many quilts to those who had served in the military. Such fine women....and not only these..but so many more that belong to the MLQG. The showing of the last quilt Mary Jane made, "Coming Home." Words written by Madalene Murphy, the other very fine woman who co-founded the MLGQ. She continues to create, teach and inspire...a woman I admire greatly. While I will always treasure the time I spent with Mary Jane (my life has been forever changed because she took the time to reach out and invite me to learn to hand quilt).....Mary Jane is not the only amazing woman I met while living and traveling to PA....there are many and you will see some of their quilts below. PS...please keep in mind the lighting was not necessarily done for photography and there were lots of people and I could not always get the best angle to take the photographs.